True. Noble. Right. Pure. Lovely. Admirable. Excellent. Praise worthy. There is only one who is all of these all the time – Jesus. When we encounter these things, we give glory to only Jesus. These things are wonderful and they should be what is running through our hearts, minds, and spirits! Yet what do we often fill our hearts, minds, and spirits with? Complaining. Grumbling. Gossip. Personal demeaning of yourself (I’m too fat, I’m too obnoxious, etc.). And a whole slew of other crap that distracts us from Jesus. This week has been a really challenging week and I stumbled. I found myself centering my thinking and my heart around complaining and meditating on the negatives going around and within me. This is not the life God intended for me to have. I am not referring to my job (injured for a reason and a season. He determined when the reason is fulfilled and when the season is over. I do not.) I am referring to the mental state and spiritual state I have out myself into with my complaining and gossip and spiteful words. He is good, he is true, he is oure, he is right, he is lovely, he is admirable, he is excellent, he is praiseworthy – He intended for us to think and to meditate on Him! Meditate meaning to put our whole effort into focusing in on God. We can do this while at work – it does not matter who you are surrounded by, speak your prayers out in a soft voice, barely a whisper. Speak your prayers in the bathroom, at the coffee pot, water cooler, in the hallway, if you work in an office by yourself. I mean there is no reason you can’t be praising and thinking about God while you are working. He gave you the job and He is going to help you do it when you honor Him throughout the day. We are to think on these things. 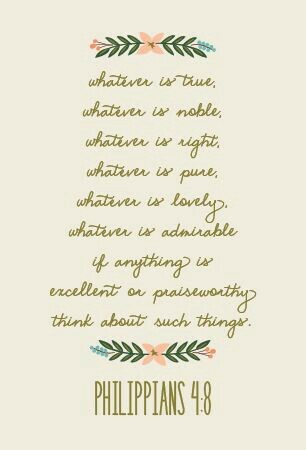 When we keep our minds full of the better thing (things listed above: true, poure, etc.) Then there is NO room for the other distractions, the fake imitations meant to keep you from God’s best. I don’t know about you, but I’m holding out for God’s best. Not a mediocre version that I force, but the one He picked. The one He chose. The one He has paved the way for. The one He is my rear guard on. Help us Jesus to focus on you. To think on the things of you. To meditate on your goodness above all else. Thank you Jesus for another day, for another opportunity to praise your glorious name!